(TibetanReview.net, Mar13, 2015) – The 56th anniversary of the Tibetan national uprising against Chinese occupation rule on Mar 10 was marked in the Russian Federation with a public commemoration function in capital Moscow, with a prayer service in the predominantly Buddhist republic of Kalmykia and with other similar events organized by Tibet support groups in the city of St Petersburgh as well as in the Buryat and Tuva republics. The commemoration in central Moscow, held in the Nicholas Roerich Museum, was addressed by Telo Tulku Rinpoche, the recently appointed Honorary Representative of His Holiness the Dalai Lama for Russia and Mongolia. He spoke about the current tragic situation in Tibet and the importance of the Tibetan culture, language and religion, which was facing destruction under Chinese rule, especially for the Russian Federation where three republics have followed Tibetan Buddhism for centuries. Telo himself is the spiritual head of the Kalmyk republic. Buddhist community and Tibet support group members, intellectuals and journalists were among those who attended the Moscow event, which was organized by Tibetan Culture & Information Center, with support from the Drepung Gomang Center (a branch of the Drepung Gomang Monastery in south India) and the Moscow-based Save Tibet Foundation. 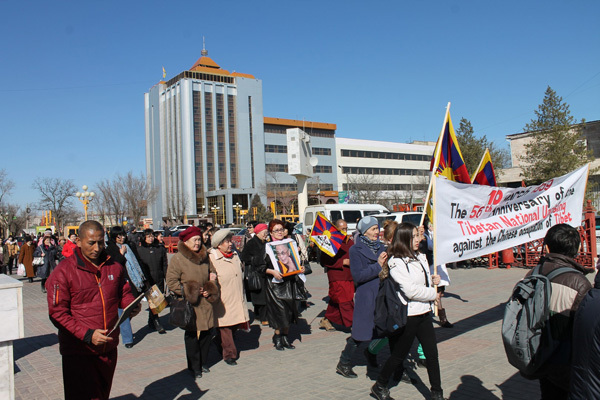 In Kalmykia, apart from a prayer gathering held at the historic Buddha Statue in the center of capital Elista, the Kalmyk Friends of Tibet​ Group also organised commemoration meetings at several high schools where Tibet Museums had been opened in previous years. Tibet’s exiled spiritual leader, the Dalai Lama, has not been able to visit Russia in recent years despite repeated pleas from its Tibetan Buddhist followers due to pressure from China.